If you are looking for some tips on how to delegate, then read on. Delegation is an essential skill for anyone in a management or leadership position. It requires that you learn to trust your staff and let go of the detail of how tasks should be performed You simply monitor whether outcomes are being delivered. Effective delegation can allow you to focus more on strategy and forward planning for your business. However you need to learn to trust the capability of your staff ….. although this doesn’t mean blind trust. When it is done skillfully, delegation is a management tool offering benefits to the manager, the employee and the organisation. Many new managers are advised when they are appointed to their new management role that they now have to delegate, but often they are not shown how to delegate or given any guidance about the delegation pitfalls to avoid. Decide what you can delegate. Monitor the delegated task, providing some positive feedback and ensuring that the task remains on track. Be careful to avoid checking up outside of the agreed checkpoints – otherwise it may show distrust. Task review. Was the task completed satisfactorily and what did the employee feel they gained from the opportunity? 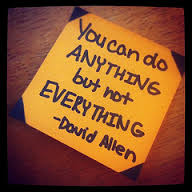 Not delegating at all …… because you think “No-one can do it as good as me?